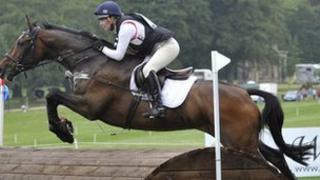 Horse trials in West Yorkshire will be the last chance for many riders to qualify for the Olympics. Bramham International Horse Trials near Wetherby has extended the competition to 100 extra entrants after rain led to the cancellation of two other important UK equestrian events. The horse trials at Badminton and Chatsworth were to serve as selection events for the 2012 Olympics. Around 250 competitors would now compete at Bramham, organisers said. "Bramham 2012 is the final qualifier in Great Britain for people seeking professional qualification for the 2012 Olympics," said Winnie Murphy of Bramham International Horse Trials. Horse trials are made up of dressage, cross country and show jumping. Team GB's Nicola Wilson from Northallerton in North Yorkshire is expected to be competing on her horse, Opposition Buzz, to secure a place on the British Olympic team. Joylse Clancy from York and James Somerville from Harrogate in North Yorkshire are also expected to compete for a place on the Olympic team. "From a selection point of view, a lot of the teams haven't had the run because Badminton and Chatsworth were rained off in May," said Ms Murphy. "Because of this we decided to run as many as possible." Sideline events at Bramham include high-level show jumping, Pony Club and young horse events, and showing classes. Ms Murphy said 60,000 spectators were expected at the four-day event event, which would see riders from France, Germany, Belgium, Australia and New Zealand competing. Zara Phillips and William Fox-Pitt will also be among those competing for a place in the Olympics.